The Red Sox announced after game one of the club's doubleheader on Saturday that they've activated outfielder Shane Victorino (hamstring) from the disabled list and have optioned Jackie Bradley, Jr. to Pawtucket. Victorino, who's starting at center in game two of the doubleheader, played in one rehab game before he was activated, going 2 for 4 with a home run and a strikeout as a PawSox on Thursday. He's batting .283/.343/.362 in 34 games with Boston this season. Bradley played in seven games in his second stint in the big leagues this season, batting .238/.238/.476 with an uncharacteristic strikeout-to-walk ratio of five to zero. 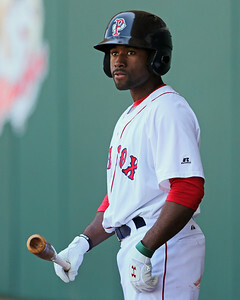 He hit his first career home run in the Red Sox' 17-5 rout of the Texas Rangers on June 4. The 23-year-old returns to Pawtucket where he's batting .354/.457/.544 in 20 games this season.